I downloaded this novella after seeing the author advertise it on her blog. At the time it was free, but it is definitely worth buying, especially since it’s currently only $0.99! I am a big fan of steampunk romances, but it can go wrong so easily. I was relieved McIntyre knew what she was doing. She was able to easily mix the steampunk elements into the storyline without making it confusing or losing my interest. Some author’s try to make it too complicated or can’t adequately describe what they are trying to convey to the reader. McIntyre didn’t lose me once. I didn’t realize this novella was as short as it was. Halfway through, I noticed, and my heart broke! I want an entire series of this badass couple. I would read and love every single word. It’s been a long time since I was so wrapped up in a couple, wanting to scream at them to just kiss each other. Their banter had me laughing out loud (in public mind you) and I just overall loved them as people. I do feel the novel could be refined a little. Viola eludes to her past a lot without revealing any information, and sometimes, it doesn’t add to the story. We learned early on that she has a troubled past that has shaped who she currently is. There is really no need to keep going back to it unless more information is revealed. Overall, Stolen Petals is a diamond in the rough. If the author decided to make it a series, or write more about them, I can guarantee I would be first in line to buy it. Are there any good steampunk romances you recommend? 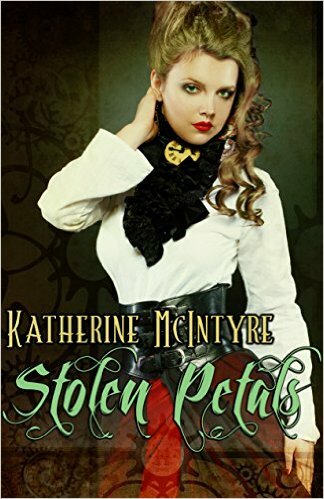 This entry was posted in Books, Reviews and tagged book review, Books, katherine mcintyre, reading, romance, steampunk, steampunk romance, stolen petals. Bookmark the permalink.